PAC offers 12 different types of recyclable packaging solutions. They range from poly flat and bubble mailers, paperboard mailers to flexible pouches. We are proud to offer sustainable options to our clients, but when it comes time to recycle them, we understand that it can be confusing. Do we sort them or clean them? Do we take them to a drop off spot or place them in our curbside bin? Fortunately, there are resources available to help us. The How2Reycle program is part of the Sustainable Packaging Coalition, a project of the environmental nonprofit GreenBlue. The goal of How2Recycle is to provide consumers with clear, consistent labeling that explains recycling procedures for various materials. If the company that shipped to you is part of the How2Recycle program, the packaging will be marked clearly with a label that tells you exactly where and how to recycle it. For PAC’s poly mailers, this means depositing them into the recycling bin at your local grocery store or film plastic recycling drop off. For a list of locations where plastic film can be recycled, click here. Poly Mailers: This includes bubble lined poly mailers and flat poly mailers. Most poly mailers that you receive in the mail are recyclable with other plastic film items. If there is no How2Recycle label, check the bag to see if it is labeled with a recycling code. Plastics with the plastic codes 2 and 4 are recyclable in the same bins where you can recycle plastic grocery bags. These locations will also take other kinds of plastic film and bubble film. Paperboard Mailers: Paperboard mailers can be recycled anywhere that allows cardboard recycling. Cardboard is commonly allowed in curbside containers. Sometimes it needs to be sorted from other materials, so check with your local recycling vendor for details. If you live in an area with mixed recycling bins you can refer to this Mixed Recycling Mythbusters document provided by Waste Management to see what is commonly allowed in a mixed material curbside container. If you have questions, always refer to your local recycling vendor. Often, they will have instructions posted on the company website. 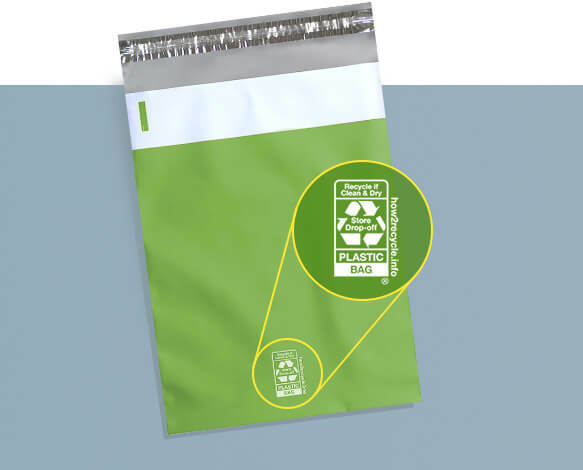 Flexible Pouches: PAC offers a recyclable and a compostable pouch option. Recyclable pouches should be treated in the same way as poly mailers. Compostable pouches can be deposited in any commercial compost bin, whether curbside or drop-off. Compostable pouches are not recommended for home compost bins, as they don’t reach a high enough temperature for biodegrading. You may also mail your recyclable mailers to the closest #PAC location! Visit our locations, and find our addresses on the bottom of the page. Label it “Attention: Recycling Program”. Want to help get the word out about recycling? The best and most efficient way to get the word out is through clear labeling and instructions. If you know of a company that uses poly mailers for shipping, encourage them to join the How2Recycle program and make it easier for all of us to do the right thing. For more information on how to join How2Recycle, contact us. For information on how to recycle other plastics, you can refer to this guide, or contact your local recycling provider.